More than 50% of booths have already been sold for a major new free-to-attend plastics industry event that will take place at Huntington Convention Center in downtown Cleveland, Ohio on May 8-9, 2019. Organized by AMI, the event will include three focused tradeshows – the Compounding World Expo, the Plastics Extrusion World Expo and the Plastics Recycling World Expo. Over 120 companies have already booked their booths at these three tradeshows. The latest leading suppliers to join the event include Azo, Chemours, Clariant, Colines, Exxel Polymers, Konica Minolta, Nordson, Oden Technologies, Reifenhäuser, Starlinger, Universal Dynamics, and Wacker. There is enormous potential for Southern African manufacturers to increase their market share both locally and internationally. The driving force behind capturing this growth opportunity is the South African Capital Equipment Export Council (SACEEC). Held during Africa Week, LME 2019 will give local manufacturers from South Africa and other SADC regions a chance to not only display their capabilities and capacities to a captive audience, but furthermore it creates a forum for the exhibitors to network with their peers. First introduced in 1983, Chinaplas has been approved by UFI (The Global Association of the Exhibition Industry) since 2006. It is exclusively sponsored by the Europe’s Association for Plastics and Rubber Machinery Manufacturers (EUROMAP) in China for the 30th time. Africa Automation Fair, 4 – 6 June 2019, is a focused networking platform for the Automation and Control Industry and works closely with industry associations including the IIG, SAIMC and Technews Publishing. The fair targets senior buyers from South Africa, the rest of Africa and invites participation from international buyers. In 2019 Africa Automation Fair will host the second edition of the Connected Industries conference in line with growing international focus on the ‘The Fourth Industrial Revolution’ and the advanced, connected industries of the future. 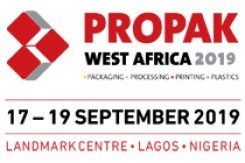 Propak West Africa 2019 is the region’s largest exhibition and conference dedicated to the rapidly expanding sector of packaging, plastics, printing and food processing. Taking place in West Africa’s economic hub; Lagos, Nigeria, the exhibition will be held between the 17 – 19 September 2019 at the Landmark Centre. With a record-breaking 4,265 attendees and at 2,049 SQM in size, Propak West Africa 2018 was the largest edition to date. Attendees increased by an astonishing 31% from 2017 while the size of the show itself grew by almost 40% after adding a brand new third Hall. Positioning itself as a truly international event, the exhibition attracted visitors from 32 different countries, the top five of which included Nigeria, Benin, Cameroon, Senegal, South Africa and Togo. With sister shows in Kenya and South Africa, the exhibition is West Africa’s most convenient platform for business, innovation and knowledge in the industry. Join thousands of senior packaging managers, consultants, suppliers and printers as they collaborate in sharing important insights and crucial experience at the industry event of the year. This September will mark the show’s 7th edition and is expected to welcome more than 5,000 key industry stakeholders with over 200 leading industry brands on display. Enjoy unique networking and learning opportunities over three days with numerous product launches, live equipment demonstrations from the industry’s leading brands and a daily free-to-attend conference. Running daily sessions of prominent presentations, technical classes and panel discussions from expert representatives and government officials, learn about the latest issues surrounding the market and understand how you can apply this knowledge to your business. The annual Manufacturing Indaba will be hosted at Sandton Convention Centre, Johannesburg from the 25 - 26 June 2019. The two-day event has shown impressive growth year on year and has proved its value in catalyzing business connections and helping manufacturers to innovate and grow their potential. The annual Manufacturing Indaba will be hosted at Sandton Convention Centre, Johannesburg from the 25 – 26 June 2019. The two-day event has shown impressive growth year on year and has proved its value in catalyzing business connections and helping manufacturers to innovate and grow their potential. The aim of the annual Manufacturing Indaba and its provincial roadshows is to bring together manufacturers, industry leaders, government officials, capital providers and professional experts to explore opportunities and grow their manufacturing operations. The event is designed specifically for private and public company representatives to hear from industry experts as they unpack challenges and find solutions for growth across the manufacturing sectors and explore regional trade into Africa. The event will comprise a two-day conference and exhibition and is hosted in partnership with the South African Department of Trade & Industry (the dti), the Department of Science & Technology and the Manufacturing Circle, representing the private sector. GOM of Germany will present current technologies in the field of optical 3D metrology as well as the latest version of its measurement and evaluation software GOM Inspect Professional with new functions at this year’s Control show in Stuttgart (7-10 May). GOM develops, produces and distributes software, machines and systems for industrial and automated 3D coordinate measuring technology and 3D testing based on latest research results and innovative technologies. The company has been developing measuring technology in Braunschweig since 1990. In its R+D departments, more than 100 engineers, mathematicians and scientists shape the measuring technology of the present and the future. VISITORS to the Compounding World Expo will be able to attend a series of six free training seminars on a range of plastics compounding topics. The practical seminars will take place over both days of the exhibition, at the Huntington Convention Centre in downtown Cleveland, Ohio, USA on 8-9 May. The opening training seminar will cover the specification of twin-screw extruders for compounding. It will be given by Adam Dreiblatt, the director of process technology at CPM Extrusion Group. Dreiblatt has over 35 years of twin-screw extrusion experience. The topic of evaluating and controlling colour in plastics will be covered in a seminar by Frank Koger, technical sales engineer at Konica Minolta Sensing Americas. He will share key knowledge garnered during the 30 years that he has worked in the world of colour. Also at Compounding/Extrusion/Recycling World Expo in Ohio, an panel discussion will debate a number of key issues surrounding the professional development of women in the plastics industry. Women in Plastics: Empowering Industry Change is a special panel featuring high-achieving women from across the world of plastics sharing their perspectives on breaking through in this traditionally male-dominated industry. Among the topics to explore, the 45-minute panel will look at the different paths these leaders have made into the plastics industry, how the modern workplace is changing to become more inclusive, and future challenges and opportunities for the next generation of women entering into plastics or other manufacturing professions. The line-up includes Lauren Hickey, director of marketing and product management at masterbatch manufacturer Americhem; Jennifer Profitt, plant manager at profile and sidings producer Associated Materials; Meli Laurance, regional commercial manager at global pigment specialist BASF Colors and Effects; Candace Sanders, assistant plant manager at PVC product supplier Genova Products; and Molly Bridger, group director of marketing at thermoplastic materials manufacturer Simona America. MeetingPack2019 is the only global meeting specialised in plastic materials and food barrier packaging. There, technology challenges posed by the Circular Economy as well as the innovation opportunities offered by the industry will be discussed in this fourth edition. MeetingPack2019 will discuss sustainable solutions for food and beverage plastic packaging and more than 300 experts from the entire value chain are expected. “The European Strategy for Plastics in a Circular Economy poses the major technological and innovation challenge of the last few decades”, Carlos Enguix, head of packaging technology at AINIA, points out. “The challenge is to ensure that, in less than ten years, all the plastic food packaging marketed in the EU is recyclable, reusable and compostable. Furthermore, packages should meet sustainability but also food safety (essential for food manufacturers and distribution), comfort and functionality requirements (for distributors, manufacturers and consumers), while being cost-competitive”, Enguix explains. THE Plastic Pollution: Effects and Solutions conference, which was to have taken place in April, has been postponed to 5-6 June at Emperors Palace. The Pumps, Valves & Pipes Africa show, the largest and most comprehensive event in Africa dedicated to all industries involved in the conveyance of liquids, gases & slurries sectors, forms part of the Indutec show takes place at Gallagher from 11-13 June. The Pumps, Valves & Pipes Africa show, the largest and most comprehensive event in Africa dedicated to all industries involved in the conveyance of liquids, gases & slurries sectors, forms part of the Indutec show takes place at Gallagher from 11-13 June. It is co-located with the African Construction Expo and Totally Concrete Expo and expecting more than 10 500 industry professionals from over 45 countries for three days of business networking. THE food & drink technology Africa show, from 9-11 July, is becoming one of the most important networking and business platforms for the beverage and food industry in South Africa, designed especially for the needs of the Southern African market. THE food & drink technology Africa show, from 9-11 July, is becoming one of the most important networking and business platforms for the beverage and food industry in South Africa, designed especially for the needs of the Southern African market. It gives a comprehensive overview of the latest developments in the beverage and food industry. Visitors will learn about groundbreaking new ideas, including international and national trends and developments, make contacts to the international trade, daily and business press, and learn from presentation meetings for practical knowledge transfer, information and networking throughout the year. ANALYTICA Lab Africa will be held from 9-11 July at Gallagher Convention Centre, Midrand. ANALYTICA Lab Africa will be held from 9-11 July at Gallagher Convention Centre, Midrand. With solutions for a range of sectors from pharmaceuticals and cosmetics through to chemicals, analytica Lab Africa will present the latest laboratory technology and analysis equipment, with knowledge exchange platforms and hands on workshops being a key theme throughout. SAPPMA has reserved two full days for PIPES XII to once again bring the South African plastic pipe industry a world-class line-up of local and international presenters. SAPPMA has reserved two full days for PIPES XII to once again bring the South African plastic pipe industry a world-class line-up of local and international presenters. The conference takes place on 27-28 August. The SAPPMA pipe conference only takes place every second year – don’t miss out on this unique opportunity! The forthcoming Composites Europe and the International Composites Conference (ICC) will be held in Stuttgart from 10-12 September. The conference programme will centre on the focal themes Smart Composites (Bio-Composites and Processing Technologies), Applications (Thermoplastics, Thermosets), Markets (New Mobility, Building & Construction), Future Challenges (Regulations and New Applications) and Composites Science (R+D Updates, Young Innovators Solutions). DIGITALISATION is increasingly making inroads into maintenance, too. A few years ago the word maintenance immediately evoked an image of a man wearing blue overalls: today, however, it is increasingly characterised by digital services and mobile devices such as tablets and data glasses. Exhibitors will be presenting examples of these at EMO Hannover from 16-21 September in Hannover, Germany. The Smart Factory and the related digitalisation offer wide-ranging potential for long-term and predictive maintenance. But what are the benefits for companies? And what are the prerequisites for ensuring that the data necessary for planning, processing and documenting maintenance measures is exchanged reliably? THE Plastic Pipes Conference Association’s spin-off event in Australasia, OzPipeE XIX, will showcase significant developments in the field of plastic pipe technology and industry. OzPipe XIX will be hosted late this year in Australia on 7-8 November at Dockside on Cockle Bay in Sydney. Speakers from the UK, USA, Belgium, China and Austria have already confirmed their attendance. The conference and exhibition will be hosted by the Plastics Industry Pipe Association of Australia (PIPA). Main corporate sponsors are Rollepaal and Baerlocher. Rollepaal is one of the world’s leading suppliers of pipe extrusion equipment and Baerlocher is a global supplier of additives to the plastic pipe industry. 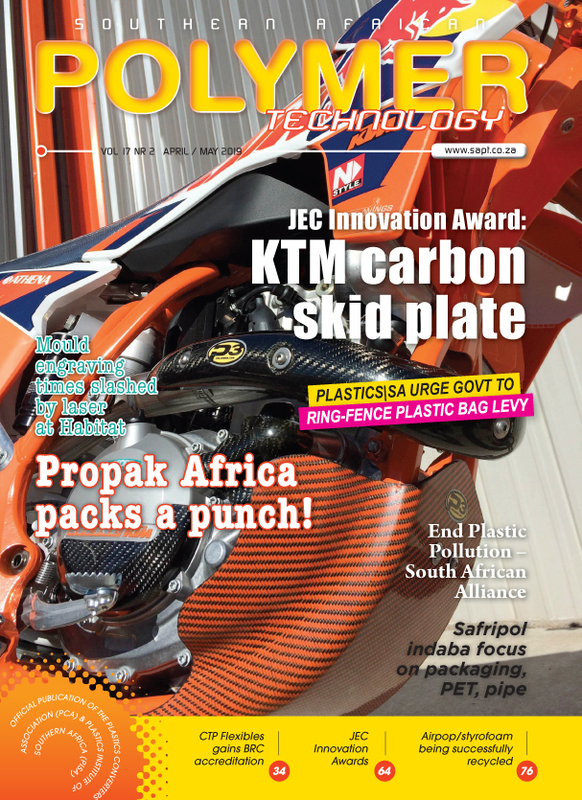 WITH a vision for massive growth – the 2nd edition of the African Advanced Manufacturing and Composites Show will be hosted by industry and government at the Nelson Mandela Bay Stadium in Port Elizabeth from 27-29 November. ARMSA (Association of Rotational Moulders of Southern Africa) will be hosting the Annual ARMO Event at Sun City in South Africa from the 16th to the 18th of September 2019 and this event promises to be an event like no other. ARMSA (the Association of Rotational Moulders of Southern Africa) is to host the international rotational moulding community’s annual global event, ARMO 2019, at Sun City from 16-18 September (Mon-Wed). The ARMO (Association of Rotational Moulding Organisations) event will overlap with ARMSA’s annual Rotation conference/exhibition and event promises to be an event like no other. ARMO members from around the world are expected to attend, so it’s a step up for ARMSA, which has been presenting its ‘Rotation’ conference/exhibition events annually for over close to three decades. Sun City has been specifically chosen since it caters for just about everyone’s needs. The Pilansberg National Park bordering on the resort hosts the ‘Big Five’ for breath-taking safaris. The resort also boasts two championship golf courses, a casino, Waterworld (with a beach), and Hot Air Balloon Safaris to name a few experiences! Exhibitions, demonstrations, seminars, safaris & socializing, in no particular order, gives you a great reason for international and local delegates to join us for ARMO 2019.